Sunny days and warm evenings are long gone but not the memories of my trip to Prague this summer. As mentioned in my previous post from a few weeks ago, I was in Prague over the summer visiting family and attending my cousin’s wedding. During our visit we stayed downtown in the city center and were able to walk to all of the main historical sites. One day I took R around Old Town and Wenceslas Square, you can read and see the photos from that day here. The second day I got to play tour guide we ventured to the other side of the Vltava River and took the cable car to the top of Petřín Hill. One of my favorite rose gardens is there, right when you get off the cable car. It’s always so beautiful in June when all of the roses are in bloom. 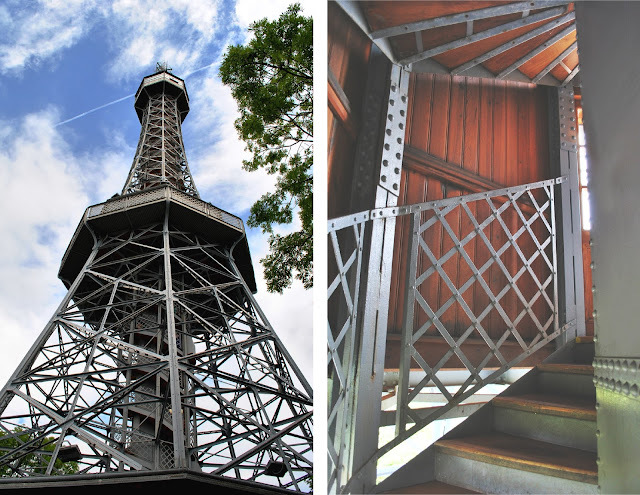 I couldn’t believe I had never been up Petřín tower, so R convinced me to climb the 299 steps up to the top to see a panoramic view of Prague. You always see so much more of your own city when you are showing it to someone for the first time. As a tour guide I like to make sure we never have to walk up hill (unless you are forced to climb the Petrin tower) so I like to take the cable car up the Petrin hill and then walk along the top to the Prague Castle. As you follow the paths you always have a breath taking view of Prague and the Vltava River. Prague castle is one of the largest castles in Europe, the entire grounds covering 70,000 m2 and. 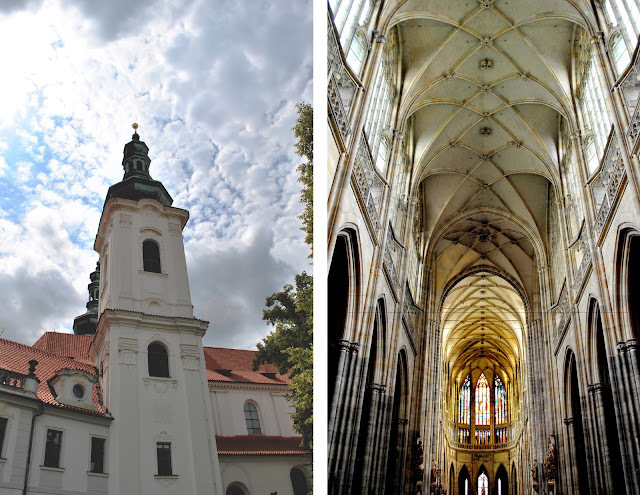 The one of the oldest parts of the castle’s complex is the beautiful Basilica of St. Vitus. Built in three series, the basilica turned into a cathedral in the early 14th century. Inside are some of the most exquisite stained glass windows and soaring gothic archways. Around St Vitus are government offices and the official residence of the Czech president. Another well-known part of the castle grounds is Golden Lane (Zlatá ulička), a series of small colored houses tucked away to the northern part of the grounds. In the 16th century alchemists lived there looking for a reaction to produce gold., hence the name – Golden Lane. Today the houses are filled with shops and exhibits depicting the history of the street. Take the royal steps down (always walking down hill never up) to the 17th century Wallenstein Garden where you get to look up at the castle from below, walk around a koi fish pond and feel like you are a royal strolling through the garden. By this time of our tour we were extremely hungry so we walked a few more streets to Malostranské náměstí and stopped at U Glabicu, a fantastic restaurant with a variety of Czech foods. We settled down to eat and have some beer while we waited to meet up with my family. Just a few blocks from U Glabicu is the John Lennon Wall. During the 1980s the wall was used by the younger generation as a way to express their grievances towards the communist government. Today visitors from around the world come and sign their names or write poems and lyrics that inspire them. Wow, these photos are gorgeous! I love all the red roofs... and that peacock! We had a bunch of peacocks that liked to stay in our backyard in the house I grew up in, I adore them so much. Beautiful photos! Prague looks like a pretty city! Wonderful impressions! I have not been to Prague yet but it looks really worth a visit. Nice to see Prague from a different point of view! Thank you =o) Glad you like them! This is so pretty! I want to go so badly! I love it! Thank you! I hope you get a chance to explore Prague one day =o) You would love it! Thank you =o) I'm so happy you like the photos! Thank you for such a sweet comment =o) I hope you get to explore the streets of Prague one day! Prague looks beautiful! Love the shot of you walking through the rose gardens! So happy to hear you love the photos =o) Thank you! Wow amazing photos. I love it. How lovely to have spent time in Prague earlier in the year both to see your family - and or your cousin's wedding! I can imagine what a lovely occasion that must have been :) The architecture is so special and I would definitely check out the changing of the guards should I ever find myself in Prague! So beautiful photos and amazing city! I'm wish I could go soon, maybe in 2017. 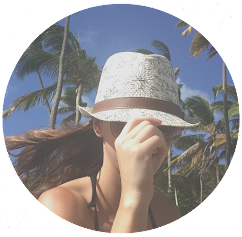 So happy you like my post =o) Thank you! How gorgeous! Prague is definitely on my bucket list! Glad to hear Prague is on your bucket list! =o) Thanks for the comment! Very scenic and interesting places, the photos are sharp and clear. Enjoyed reading this. Looks so incredible. These photos make me want to visit right now. You would love visiting Prague =o) Thanks for the comment! Thank you =o) You are so sweet! haha the food was amazing =o) thanks for the comment! Thank you =o) Happy new year! These photos gave me a small throwback to when I visited Prague myself. I loved it sooo much! So happy to hear you love Prague =o) Thank you for the comment! Prague looks amazing! I'd really love to visit one day. Your photography looks gorgeous (I'm obsessed with the same photo as you). Thank you Alice! You have to visit Prague one day =o) I think you would love it! I absolutely loved Prague, though I visited in the winter but it was still so beautiful!!! You're my kind of tour guide if you avoid hills!!! Thank you! Your comment made me smile =o) Hope you get to visit Prague one day! Beautiful photos! Everybody I know who's been to Prague has loved it so I hope I can visit it some day. Thank you! I'm glad you like them =o) The cathedral is breathtaking isn't it? I was holding my breath the entire time I was browsing your photos. I am awed! I hope that someday, I've got to witness this beauty not only in photographs but face to face. Prague is definitely one of the places on my bucket list. Heard its a beautiful place and your photos shows it. Love this city so bad!!!!! Lovely post! Looks beautiful, I've never been to Prague. I adored Prague! I was there a few years ago now, but your photos have brought back such lovely memories!